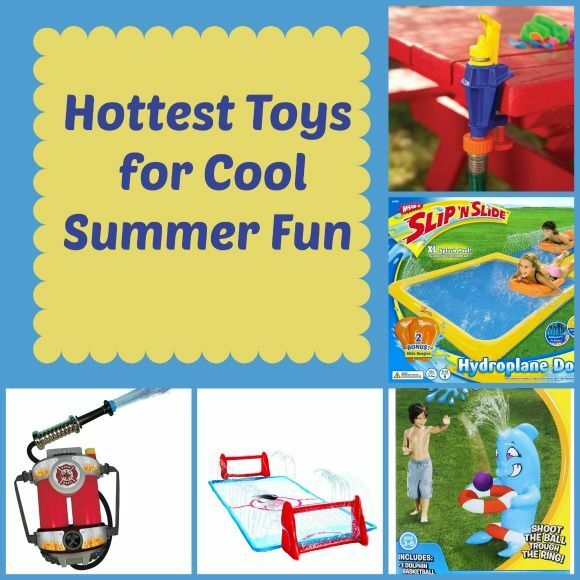 This post on the hottest toys for cool summer fun contains affiliate links. We only link to products we think would be beneficial to our readers. Summer may be half over, but the hottest days are still ahead of us in many parts of North America! Hitting the pool to cool down isn’t always easy to fit into your schedule. When the kids are complaining that it’s too hot, give them one of the hottest toys for cool summer fun to help them cool down! 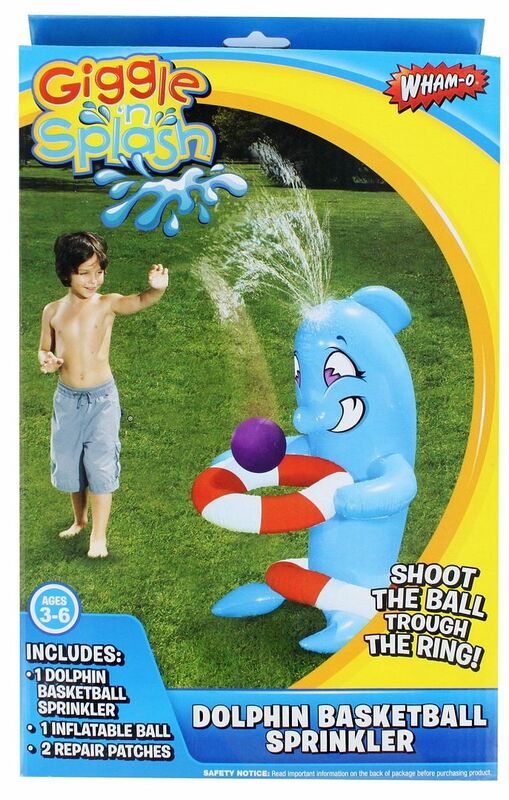 Water Bomb Factory – One of the hottest toys to stay cool is the water bomb factory. Water balloons are such a fun way to cool down on a hot summer day. The one thing that I don’t like about them, though, is how time-consuming they are to fill up and tie! The Water Bomb Factory lets you fill and tie up to 100 balloons in 10 minutes! 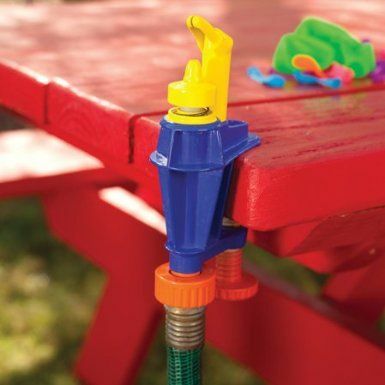 It has a clamp to hold it in place and connects to any standard water hose. The on/off valve allows you to save water in between fills. Check out our fun water balloon activities for kids for great suggestions on how to make this cooling activity even more fun! 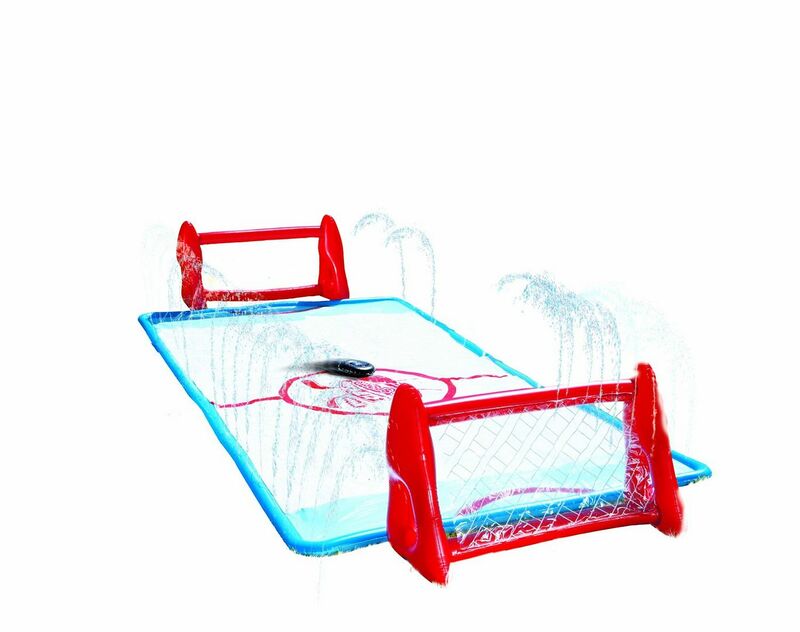 Wham-O Water Knee Hockey Rink - If you kids love hockey, they’ll get a kick out of this fun hockey “rink!” The Water Knee Hockey Rink comes with two knee sticks and 2 pucks. Young kids will have a great time sliding around trying to make a goal! Keep in mind that this is designed more for toddlers and preschoolers. Older kids can still enjoy the cooling water, but may not be too big for the full hockey experience. 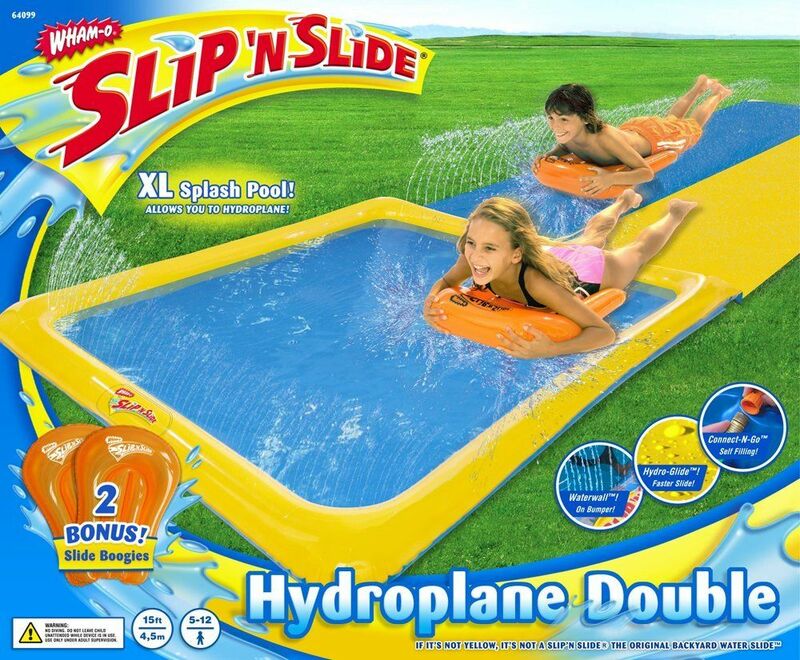 Wham-o Slip N Slide Hydroplane Double With 2 Slide Boogies - The Slip N Slide has always been one of the hottest toys of the summer, even back when I was a kid! This one is great because it has a nice large splash pool at the end. Keep in mind that these slides work best on flat lawns. Fire Power Super Soaking Fire Hose with Backpack - The Aeromax Fire Power Super Soaking Fire Hose holds up to 60 squirts of water in the backpack. Plus, it shoots a whopping 35 feet! Kids can run around and be active while staying cool at the same time. For more information on this fun toy, check out our review at OurFamilyWorld. Dolphin Basketball Sprinkler Giggle ‘n Splash - Okay, once you get past the fact that this looks nothing like a dolphin, it’s actually a pretty cool sprinkler! 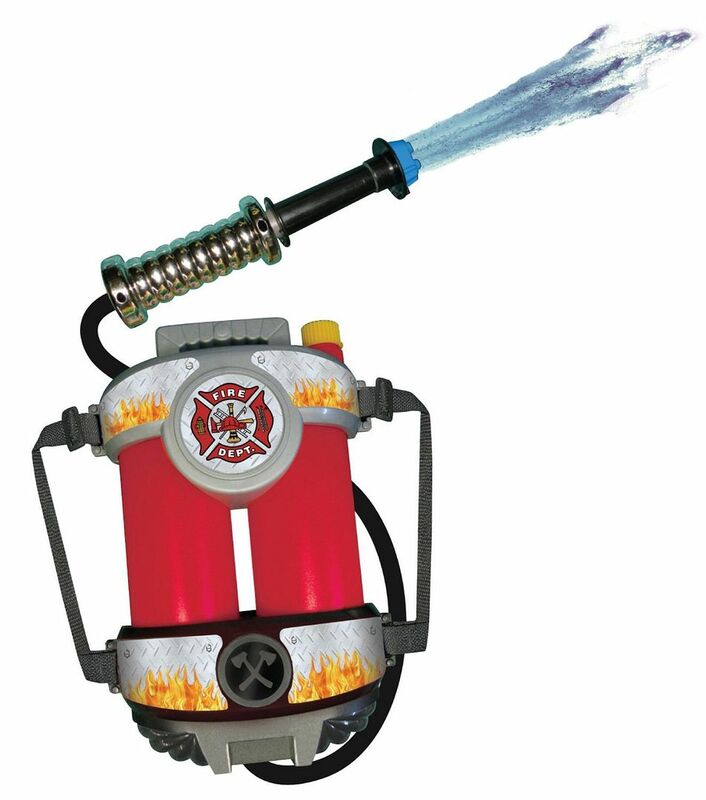 It has great reviews on Amazon, which is really hard to find in any sort of sprinkler toy. I’ve tried dozens of different sprinklers, and this one is pretty cool. It’s great for young kids. The basketball game helps develop good hand/eye coordination. It comes with a ball and repair patches. Just keep it away from sharp objects! I think I need that water bomb factory. Looks like it would make filling water balloons a whole lot simpler. It is awesome, isn’t it Angela! Practically the best invention ever! I love teh basketball sprinkler – I’ve never seen a sprinkler like that! These all look super fun! I love the hockey rink! That’s one of my favorites, Chrysa! the dolphin toy looks like such fun! My daughter would just love that. It’s such an awesome water toy, Susan – I think your daughter would love it! My daughter would LOVE the Slip ‘n Slide-if only we had a yard. I know how you feel! At my old house, I had a massive yard, but it was so hilly and rocky that I couldn’t even use it for anything like this. I was so excited when we moved to a place with a flat area!! I think I was even more excited than my son, who actually uses the slip n slide! Oh man! My boys are going to LOVE these when they get older! I’m sure of it. Thanks for the tips on what to look forward to!